HOW MANY primroses have you carried home from the grocery lately? On the cusp of spring, we’re so starved for color we’re hard put to resist the English primroses (Primula vulgaris) displayed everywhere. But there’s a reason beyond easy availability for their designation as “common primroses.” Once those pretty little plants hit the garden the results are often disappointing. It’s not a good sign when flowers look better massed in the flat than planted in the garden. Their various colors are so obvious that the effect of one bright bitsy plant after another is jarring. And if this type of primrose lives through the summer, it grows into a fat clump of sorry-looking leaves begging to be divided every time you look at it. There are better choices. My mother loved the tiny ‘Wanda’ primroses with their subtle colors and crinkled, dark leaves. They look similar to the English primroses, but scaled down and with more sophisticated colors like garnet, peach and smoky yellow. ‘Wandas’ are among the earliest bloomers, and their foliage stays fresh most of the year. I can’t remember a single March when I haven’t filled at least one pot with their modest charms. A close relative to the ‘Wanda’ series, with similar bronze-colored leaves, is the only primrose to earn a spot on the Great Plant Picks roster. Primula ‘Guinevere’ has sweet pink flowers in March and April, and grows into rewarding large clumps. Candelabra primroses, also known as drumsticks for their willowy stems topped with flower balls, have much greater presence in the garden than their ground-hugging cousins. To be forever enchanted by candelabras, plan a late-April visit to Bloedel Reserve on Bainbridge Island. Below the house in the woodland glen is a pool and stream thick with the nodding magenta heads of P. pulverulenta. Although these glorious, dark-eyed candelabras start blooming a bit later than most primroses, they continue to flower through May. 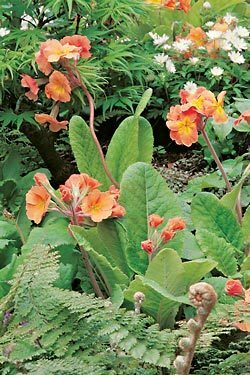 My favorites are a couple of very old types of primroses newly introduced by Log House Plants of Oregon. The curious double hose-in-hose primroses are some of the very oldest of all English garden plants, first mentioned in 1597 in Gerard’s Herbal. Their complete name is Primula tommasinii ‘You and Me,’ and you get a good idea of how ancient these double-layered confections are from the inspiration for their name. Courtiers in the 16th century wore two pairs of hose (long stockings), folding down the outer pair to reveal the inner. Kind of flash-dance dressing for the Elizabethan set, and a good visual for the blossom-nested-upon-blossom that characterizes these truly perennial, long-blooming wonders. Another heritage strain brought back into commerce by Log House is the tri-colored, silver-laced P. polyanthus ‘Penumbra,’ which looks as if each petal has been painstakingly outlined in white with the greatest care and the tiniest possible brush. Its ethereal quality is captured by its name, which refers to the slim edge of cool light that shows around the moon during an eclipse. These little beauties are suited for woodland gardens, with fragrant flowers held high above the leaves throughout the spring. Despite its delicate look, ‘Penumbra’ is a tough plant that persists through winter cold and summer heat. If you feel confused by the welter of primrose strains, cultivars and various types, just remember that all you need do is choose the ones that appeal most to you and do well in our climate. To help with the latter, Molbak’s Nursery has been running the largest primrose trial in North America for the past 12 years. Leading primrose breeders have been vetting the best of more than 180 different kinds. Top performers (drum roll here, please) include the early-flowering Hethor series of Primula acaulis, ‘Denim Blue’ which has especially large flowers, and the Danova Cherry series, which bloom later, with dark rose petals trimmed in white. Valerie Easton is author of “A Pattern Garden.” Her e-mail address is valeaston@comcast.net.